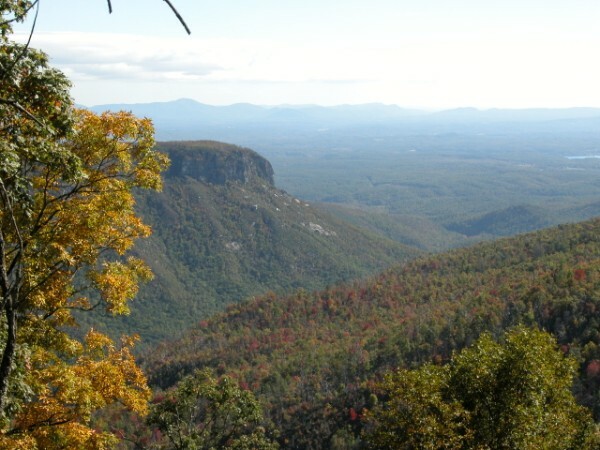 As your can see from the picture that Linville Gorge is a very rugged area. I know by experience that there are very steep hills and you need to be in good physical shape to climb those hills, especially with a 40 pound pack on your back. It's hard on an old man. Linville Gorge Wilderness covers more than 12,000 acres and has a 2,000 feet altitude above the Linville River to the gorge's rim. This picture above was taken from the top of Table Rock. The ruggedness of the gorge makes it ideal for hiking, camping, rock climbing, fishing, hunting, and site seeing. But be very careful in the gorge, you can easily get lost or disorientated. Every year personnel has to go into the gorge to rescue people that are lost and did not come out at the scheduled time. And regretfully we have someone that dies in the gorge every few years. Deer, bear, squirrel, raccoon and ruffed grouse are hunted in the area. The Brown and Rainbow Trout are found in the Linville River. You will need the proper hunting and fishing licenses and seasons as regulated by the N. C. State Wildlife Resources Commission. There are no bridges crossing the Linville River, so be careful crossing. The river can be dangerous, especially during flood season and after heavy rain. The gorge area is name after William Linville. Linville and his son were killed by Indians in 1766 while hunting in the gorge. 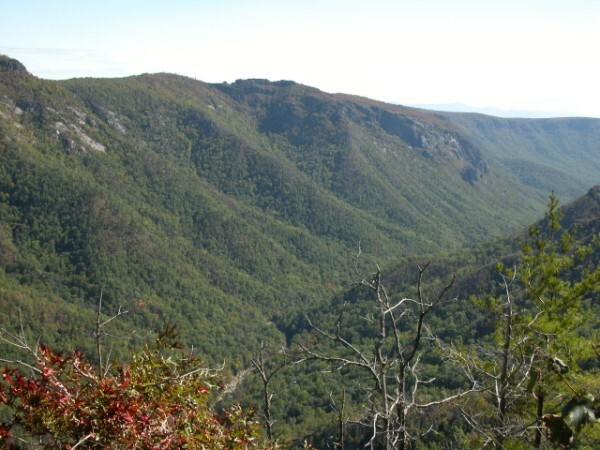 Linville Gorge was designated wildernesses in 1964.